Televisions, especially the new flat panel or plasma TVs, create their own set of challenges. Most people buy a large cabinet to house their electronics. 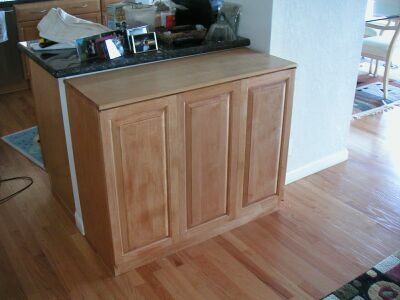 But it is important to have a cabinet that works well in a given space and works well with the interior of your house. A custom cabinet is the only way to seamlessly integrate your TV into your room. This was an alcove that was designed to hold the TV and stereo equipment. The client considered stock cabinets, but when they drafted up a design, the stock cabinets looked awkward in the space. 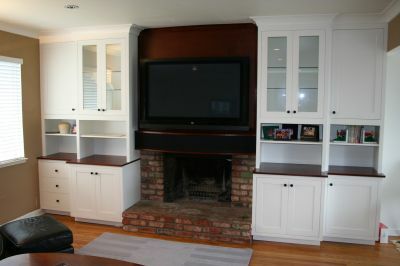 This built-in custom TV cabinet was designed to fit a flat panel TV. 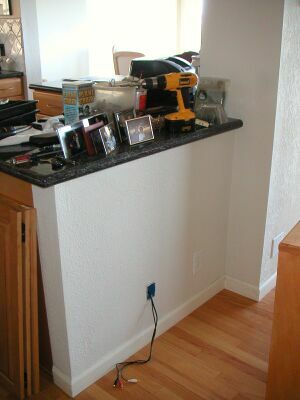 All TV and stereo components are in pull out shelves in the center of the cabinet. The DVDs and CDs fit in the drawers. The cabinet hardware had not yet been added in this picture. 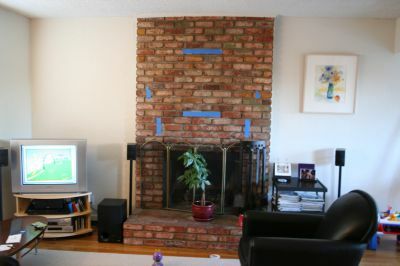 This client had a brick fireplace that dominated the room. What they wanted was their new plasma TV mounted over their fireplace with a speaker system incorporated into the mantel. They also wanted custom cabinets would include a pull-out media center that would make the best use of space and enhance the simple beauty of the room. 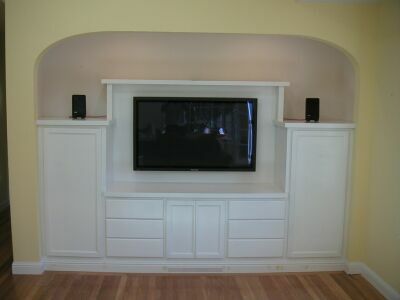 Custom cabinets were designed to hold the AV equipment and provide additional storage. Bookshelves and cabinets were all integrated. The top of the fireplace was paneled in wood and the plasma TV was mounted over the fireplace. The AV cabinet on the left has a nice pull-out unit to make the electronics completely accessible. A custom mantel was built to house the Yamaha YSP-1 speaker. This fireplace was converted to a zero-clearance insert, so the heat wouldn't be a problem for the speaker in the mantel. The client made a beautiful selection of colors, keeping the wood behind the TV dark so that the TV was not the focal point in the room. There are more pictures of this cabinet system on our Built-in Plan site. You also may want to see our fireplace gallery for more ideas on updating your fireplace. 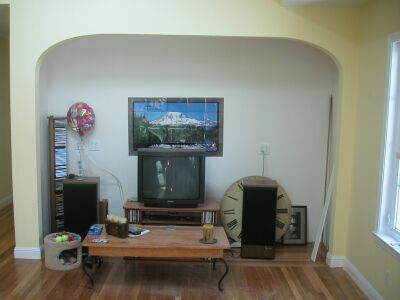 The TV barely fit in this space between the living room and the kitchen. The client wanted to lift the TV and tilt it slightly, and have a cabinet that matched the kitchen to hide the TV away when it was not in use. This custom TV cabinet fits the TV and the space perfectly. The hinges were designed so that the doors could open completely and out of the way of traffic. 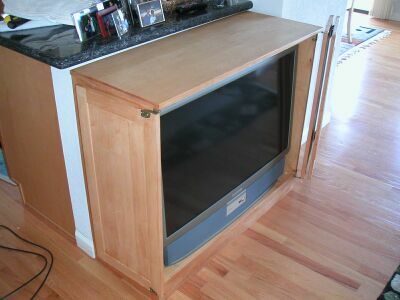 The interior of the custom cabinet was tilted slightly so that the TV sits at the correct viewing angle.